We hold an internationally leading position in neurooncology and are an integral part of the Neuroooncology program at the National Center for Tumor Diseases (NCT) Heidelberg. Every year, we provide diagnostics and treatment for more than 3.000 outpatients and 1.000 stationary patients on a specialized ward with 18 beds. The Neurooncology program in Heidelberg offers unique features such as innovative clinical trials, the option of molecular stratification and targeted therapies, and a high number of specialized staff taking care of patients with these rare but severe disorders. The Heidelberg Neurooncology Program holds a leading international position in terms of basic and translational research, trial activity, patient numbers and innovation. The combination of new chairs and young investigators in neuropathology, molecular and clinical neurooncology, as well as research units in molecular genetics, neuroimaging, and radiation oncology, has enabled the Heidelberg University Hospital, the DKFZ and the NCT to assemble a critical mass and install neurooncology as a prototypical interdisciplinary profile area. The program provides optimal diagnostics and treatment for all patients with brain tumors through scientific excellence and highest clinical and trial standards. Every year, we consult more than 3.000 patients and treat more than 1.500 patients with tumors of the nervous system. The overall aim is to enable practice changes through precision medicine in immunotherapy, radiation oncology, and targeted therapies. In a Phase II study, re-irradiation was compared alone and together with the recombinant protein APG101 blocking the CD95 signaling pathway. Epigenetic studies showed that patients with low CD95L promotor methylation seemed to have a greater benefit from the addition of APG101 to re- irradiation . In this group (red line), the risk of mortality was reduced by 82% (HR = 0.18) (Wick Clin Cancer Res 2014). The Neurooncology program ensures multidisciplinary and comprehensive research, diagnostics, a unique translational, and clinical infrastructure and trial portfolio for adult and pediatric patients with brain tumors and neurological problems associated with cancer. More than 20 clinical departments and research groups at Heidelberg University Hospital, DKFZ and NCT support the program. Since 2007, the profile area has been further developed by the Clinical Cooperation Unit (CCU) for Neuroimmunology and Brain Tumor Immunology (M. Platten, in cooperation with DKFZ), the CCU for Neurooncology (W. Wick, in cooperation with the DKFZ), the Junior Group for Brain Tumor Metabolism (C. Opitz, at DKFZ), the Professorship for Experimental Neurooncology (F. Winkler), the Max Eder Junior Group on Low Grade Gliomas (S. Turcan) and the strategic development of research groups that encompass Neurooncology (W. Wick), Radiology (M. Bendszus, A. Radbruch), Radiation Oncology (J. Debus, A. Abdollahi), Neuropathology (A. von Deimling), Neurooncology in Neurosurgery (C. Herold-Mende) and Neurobiology (A. Martin-Villalba). Originating from pediatric neurooncology, the program provides brain tumor patients with a genome-wide methylation analysis using 450/850k arrays and brain tumor panels. This allows a precise molecular diagnosis including assessment of important single biomarkers used for prognosis and therapy prediction. Within our department, scientific highlights include the work of the groups headed by M. Platten, C. Opitz, and W. Wick, unraveling the relevance of the tryptophan metabolite kynurenine as an immunosuppressive and cancer-promoting agent and the first known endogenous ligand of the arylhydrocarbon receptor (Opitz, Litzenburger Nature 2011). The groups of A. von Deimling and W. Wick have spearheaded the translation of new molecular parameters in brain tumors into biomarkers, including the development of diagnostic tests (Wiestler Acta Neuropathol 2014; Capper Acta Neuropathol 2013; Wiestler Acta Neuropathol 2013; Wick Neurology 2013; Sahm Blood 2012). This work has partially been supported by DKFZ HIPO. In cooperation with the Neuroradiology department (M. Bendszus, S. Heiland, P. Kickingereder, A. Radbruch and many others) we have integrated novel MRI techniques into diagnosis and follow-up of brain tumor patients. A recent project established multi-parametric response maps, including advanced perfusion and spectroscopic techniques for molecularly-based imaging and extraction of features from MRI raw data. Most recently, the Winkler, Wick and Platten groups discovered a novel growth and resistance mechanism in gliomas. Membrane nanotubes were shown to be the basic constituents of infiltrative gliomas creating an adaptive and communicating network of the tumor within the brain explaining resistance and allowing the consideration of gliomas not as focal but rather whole brain disease (Osswald Nature 2015). Due to the relevance of angiogenesis to malignant gliomas, the department has contributed significantly to larger international trial activities (Chinot, Wick NEJM 2014; Wick. ASCO 2016). The Platten and Wick groups have unraveled the mutant IDH protein as target for precision immunotherapy (Schumacher Nature 2014, Bunse J Clin Invest 2015). The groups have also joined forces to develop the preclinical basis and a first-in-man clinical trial with a peptide-based vaccine that targets mutant IDH in grade II-IV gliomas. A pilot immunotherapy trial (NOA-16) has been initiated in Heidelberg and at several partner sites of the German Cancer Consortium (DKTK). Another Heidelberg-coordinated trial takes advantage of the peptide development within the EU Glioma Actively Personalized Vaccine Consortium (GAPVAC) for personalized immunotherapy. Further work towards clinical translation includes the Wick and Platten groups’ development of the first predictive biomarker for elderly glioblastoma patients (Wick Lancet Oncol 2012). 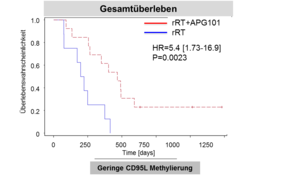 The APG101 trial (W. Wick, M. Platten, A. von Deimling, M. Bendzsus) was the first successfully controlled trial in recurrent glioblastoma in 10 years investigating the soluble CD95 receptor in combination with radiotherapy. It provided the basis for the development of methylation at CpG2 in the CD95 promoter as a predictive biomarker (Wick Clin Cancer Res 2014).